Nature’s goodness comes in many forms: the sight of red leaves of the sumac, the smell of a walnut, the sound of a Carolina wren, the feel of pine duff under foot, and the taste of spicebush tea. Spicebush (Lindera benzoin) is a woodland shrub native to the eastern half of the United States. Spicebush is very adaptable to growing conditions but does prefer moist, rich soils and can grow to be 12 feet tall and 15 feet wide. It is a member of the Laurel family which also includes sassafras. The spicebush swallowtail butterfly relies on spicebush and sassafras as a larval host. It also works great for landscaping as deer do not like to eat spicebush. The early spring blooms and red berries in the fall also make it an attractive plant. One of my favorite aspects of learning wild edibles is discovering the history of American Indian and pioneer uses. The leaves, twigs, and berries can all be used. The Iroquois and Ojibwa tribes of North America considered the spicebush berries as two dissimilar seasonings. They would separate the seeds of the berries from the pulp and skins. The pulp and skins would be used as an allspice-type flavor. The seeds of the berries were used for their fiery taste. 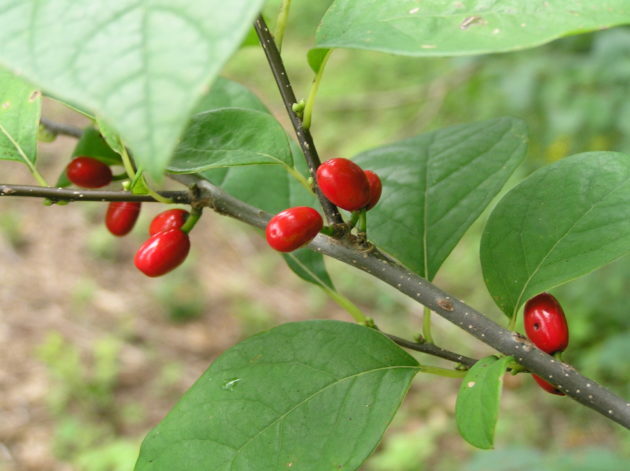 American Indians recognized spicebush as a warming herb that improves circulation and increases perspiration rates. They used it for other medicinal purposes, too. During the Civil War, spicebush tea often substituted for coffee when rations ran short. Dried leaves were often used for this purpose, but young branches were also steeped to make a tonic. This spicy beverage had medicinal qualities as well. It was used to reduce fever, to relieve colds and dysentery, and to destroy intestinal parasites. 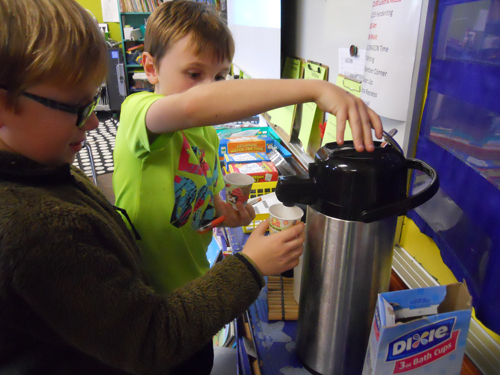 After a long winter, pioneers often made a “spring tonic” of spicebush tea. 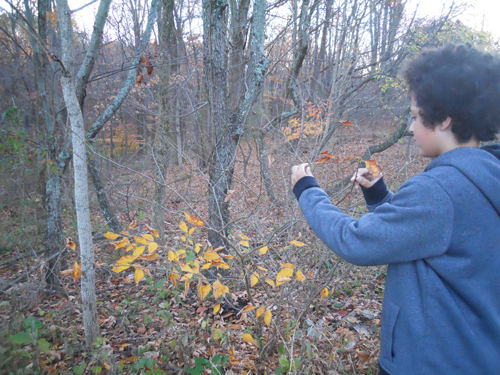 The aroma of spicebush’s crushed leaves or broken twigs make it easy to identify. I love chewing on a twig as I walk through the woods or bringing a branch back to the house to make some spicebush tea. Here is a simple recipe to try. 2. 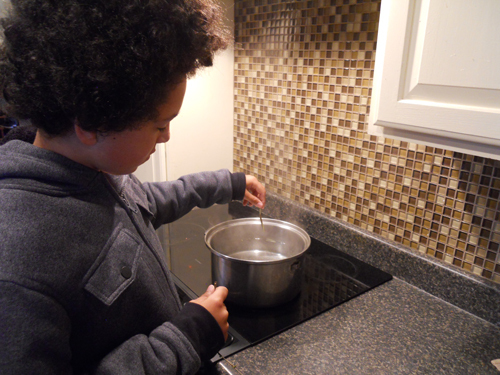 Boil water, then remove from heat source. 3. 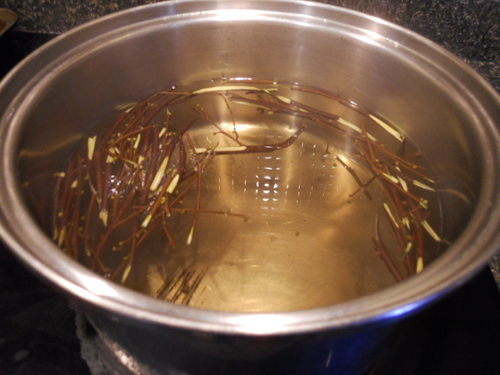 Break twigs into small pieces and place in the water. 4. Let spicebush steep about 10 minutes. Sometimes I strain the plants from the tea, or often just leave the plant parts in the liquid until the tea is all gone. The longer you steep it, the more robust the flavor and aroma.